Mr Grinshaw, Rhuallt: " We have no hesitation in recommending Probuild for any building project. They are a team of professional and highly skilled craftsmen. Our future custom with Probuild is assured. We cannot thank Evan and his team enough for the high standard of work carried out on our project." Mr Jones, Llandudno: "The standard of work is very high. 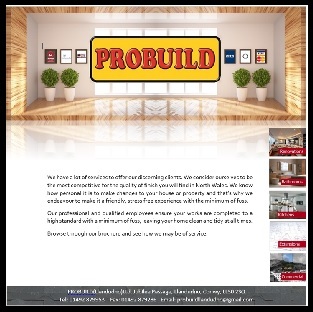 The speed of their response is second to none and you know you can rely on Probuild." Mr Gribble, Llandudno: "Probuild is an exceptional company. From start to finish the team are extremely skilled, courteous and considerate and work to precise and meticulous standards. We are absolutely thrilled with the whole team and the results of a complete home makeover." Mr Norrie, Deganwy: "We have two properties dating from the very early 1900s and have used Probuild for the past 5 or 6 years to refurbish and renovate size residential and seven commercial units. We have always found Probuild to be highly professional in their advice, estimating and execution of the contract…For piece of mind we go for Probuild everytime."